In the last decade several persons have approached me with data that they understood to promote lunar Sabbath calculation. This new and fascinating theory suggests that the seven day week was reset after each new moon. (And as a result, the Sabbath would always fall on the 8th, 15th, 22nd, and 29th of a given lunar monthi.) A large electronic advertising campaign promoting this view has been conducted continuously for years. And the result is that many persons now keep a Sabbath that happens, generally, on neither Saturday nor Sunday. I say “generally” because they keep their Sabbath on a different day of our calendar each month. Practically, this means that while there are seven days from Sabbath to Sabbath in the calendars of the whole planet, it isn’t always so for the believers in this theory. They have eight or nine days between the 29th Sabbath and the next 8th Sabbath. That is because they have one or two “new moon” days added in between “weeks” each month. I have concluded that the data in support of this idea is faulty. Various parts of it are either speculative, strained, inference-based, or uninspired. Whether approached Biblically or from a historical standpoint, the idea has not stood up to scrutiny. First, let me summarize the nature of evidence that I have seen so far as given in support of the idea. It is suggested that Sabbath falls on the 15th of three Biblical months in a row (the three months beginning with the Exodus from Egypt). As moon cycles are only 29.5 days long, the Sabbath could not fall three times in a row on the 15th unless the Sabbath was lunar based. It is asserted that no Sabbath in scripture can be shown to occur on any day other than an 8th, 15th, 22nd, or 29th of a lunar cycle. As only about 15% of Gregorian-style Sabbaths fall on those days, this is taken as corroborative evidence for lunar Sabbaths. It is asserted that the lunar calendar was essential to the determination feast days in the Old Testament. As such, it must be a valid calendar. And if the calendar is right for calculating feast-day dates, it must be right for calculating Sabbath dates as Sabbaths are among the feasts. It is asserted that ancient authorities trace the seven-day week to Babylonian sources and that the Jews anciently kept the Sabbath on a lunar basis. This Jewish habit was changed by the Roman power and is the reason that Jews currently honor Saturday as found on the Gregorian calendar. Circumstantial evidence, it is asserted, points to Lunar Sabbaths in the time of Joshua, Solomon, and Hezekiah, and Paul. The New Moons do not count as “working days” and so there are still 6 working days in each weekly cycle in the new moon calendar. While other thoughts have appeared here and there in lunar documentation, these are the ones that appear repeatedly in the documents I have read. 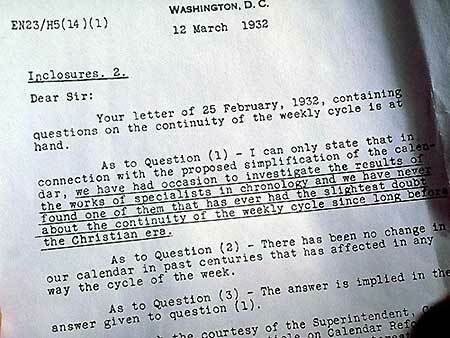 What appears in not one of the documents is a “thus saith the Lord” teaching that new moons interrupt the weekly cycle. The most intriguing argument, to me, in the six listed above was item number two. The word “Sabbath” appears more 100 passages of scripture. It seems, at first thought, that if not one of those can be shown to fall on the 2nd, 3rd, 4th, 5th, 6th, 7th, 9th, 10th, 11th, 12th, 13th, 14th, etc., day of the month, that that would be fairly significant evidence in favor of the lunar Sabbath theory. There are many passages that refer to the Sabbath in a precept in such a way as to provide no precise and certain information regarding the correlation of days with months. There are 20 Stories in scripture that refer to the Sabbath, but without dating it in terms of a day of the month. See Nu 15:32; 2Ki 11:5-9, 2Chr 23:4-8; 2Ki 16:18; Neh 10:31; Neh 13:15-22; Matthew 12:1-12, Mark 2:23-3:4, Luke 6:1-9; Mark 1:21; Mark 6:2; Luke 4:16; Luke 4:31; Luke 13:10-16; Luke 14:1-5; Acts 1:12; Acts 13:14-44; Acts 15:21; Acts 16:13; Acts 17:2; Acts 18:4; John 5:9-18 ; John 9:14-16 . There are only two stories in all of scripture that mention Sabbath in a context that can be certainly dated in relation to a day of the lunar month. These are the first giving of the manna and the death and resurrection of Jesus. See Ex 16:23-29 and Mt 28:1; Mr. 15 42; 16:1; Lu 23:54-56; Jo 19:31. So how many Sabbath stories in scripture are really datable? Two. This fact neutralizes the first two arguments. Regarding the third point, it is obviously true in scripture the Jewish feast daysii were calculated based on the Jewish lunar calendar. But the extrapolation that says “if dates of the year must be calculated on an annual calendar, therefore days of the week must also be so calculated” is unwarranted. No prophet says anything of the kind. History does not back it up. Muslims today use a lunar calendar but keep a weekly day as honored. The argument that a continuous weekly cycle is Biblically inconsistent is purely speculative. And that is the polite way to say it. The fourth point, strictly speaking, is not a Biblical one. But the history is faulty. The fact is that from Paul’s day (in the book of Acts) there were Jews in “every city” that read the Torah on Sabbath. Jews had been scattered by Assyria and Babylon, long before the rise of the Romans. They were important persons in Persia and in Africa in lands not subject to Rome. Now think this through: There is no way that one million Jews scattered all over the world could, simultaneously, be convinced to change their method of Sabbath keeping without abundant historical evidence being left behind to prove it. But more than this, the gospel was carried to every part of the known world during the first century. Lunar weeks predict that when the apostles traveled to India, Ethiopia, and the British Isles, that these places began keeping lunar Sabbaths. None of these were under the influence of Rome by the 3rd century. This is why they kept the Seventh-day Sabbath so many centuries after Rome had stopped. And there is no way that Christians around the world, faithful Sabbath keepers, could be convinced to change their day of worship without it showing up in history. The change of the Sabbath to Sunday shows up abundantly in history and proves, by this very appearance, that the other change never occurred. The fifth point is circumstantial. If someone gathers by complicated reasoning that such a story must have happened on such a day of the month, their conclusion is suspect. See the footnote regarding John 9 for example of what I mean. Further, we do not want to ever turn an observation of practice into a command. We want plain and direct commands for our practice. And no such command exists for the lunar Sabbath theory. Genesis 8:13 Noah removed the covering of the ark, a great feat. Numbers 1:1 The men of Israel were counted on the first day of the week. Ezra 7:9 Ezra was traveling on two new moons. The reasoning goes like this: If the gate is shut on the six working days and open on the new moon, then the new moon can not be one of the six working days. And since it is not one of the six working days, it must not be part of the week. The fault lies in the fact that the verse is a perfectly natural way to write even if the new moons did occur on various days of the week. The inference that lunar Sabbath proponents make is unwarranted and stretched. It would be similar in character to reading “God loves a cheerful giver” and concluding that God doesn’t love other grudging givers. The Bible is brief and well written. We can not impose on it a demand that enough details be given to prevent us from making false inferences. Rather, we should demand a “Thus Saith the Lord” for our articles of belief. Not one of the six primary lines of evidence for lunar Sabbaths holds up under investigation. That could settle the issue for me. No evidence for a life-changing idea is evidence enough that it is false. But there are some facts that settle the matter more substantially. Let us consider them. The facts relating to the Mark of the Beast and the Seal of Godiii demand that the issue be one easy to settle on the basis of scripture. Simple minded persons must be able to stake their life on the fact that they are right. And simple minded persons the world over have flocked to the simple truth that showed their willingness to brave opposition to be faithful. But the Lunar Sabbath theory is not one that can be traced to a command or a simple statement. It is complex, and this is a sign itself that there is something fishy about it. The first week began in Genesis 1 before the moon began shining. This settles the fact that the week has always been independent of the lunar cycle. The phrase “seven weeks” should be 49 days by standard calendars. By a lunar-solar calendar, however, it would be 51-52 days. Leviticus 23 and Daniel 9 both establish that “seven weeks” are 49 days. And that simply disproves the lunar-Sabbath idea. The timing of the 1260 year prophecy (538 AD to 1798 AD) is entirely too late for changing the nature of the week.iv When the papacy was established as a civil ruler of the Roman empire it began a historically documented assault on Sabbath keeping. That assault eventually changed the way churches from India to Ethiopia to Ireland related to the Sabbath. Jews during that same period retained their Sabbath keeping through-out the papal states. The week was being counted before the creation of the time-keeping pieces of the sun and the moon. The Sabbath, like marriage, comes to us from the Garden of Eden. It has always had faithful observers. When light shown on the Law of God in fulfillment of Revelation 11, the Sabbath truth was revealed to many of God’s people around the planet. The confusion that the lunar Sabbath ideas have created is not sensible. The arguments regarding “three months in a row” and “all Sabbaths in scripture on the 15th, 22nd, etc.” are only so much misunderstandings and speculations. The gifts given to preserve the church from such winds have been despised. And a “thus Saith the Lord” for lunar-Sabbath keeping should be demanded. It cannot be produced. One organization has offered a substantive reward for a Biblical refutation of the lunar Sabbath doctrine. Appended to that offer was a quote of Luther, “By the mercy of God, I conjure you, . . . to prove from the writings of the prophets and apostles that I have erred. As soon as I am convinced of this, I will retract every error . . . ."
This is a noble position, and a rare one. May it be the sincere position of those who have been erroneously carried away with the pseudo-history of the lunar-Sabbath proponents. I would stop him. I wouldn’t need to hear any more. If his best and first arguments are worthless, then his whole case is unconvincing. You see, David Young is her brother. Zachery is her nephew. Boo-boo is her Yorkie-Chihuahua. And we have a guest bed for teen-age nephews in our shed. I am illustrating an idea. The fact that someone has a long list of arguments is not evidence that they are correct. It may just be evidence that they are determined to make their point. And if the first of these arguments is weak, there is no need to be troubled about their conclusion. Nevertheless, for the sake of being thorough, the follow comments are offered on some strained arguments made in favor of the lunar-Sabbath falsehood. But look at the passage quoted, Lev 23:4-16. Specifically note verses 7-8. Not only does it make the first day a Sabbath, but it also makes the seventh day of the feast a Sabbath. In the first day ye shall have an holy convocation: ye shall do no servile work therein.8 But ye shall offer an offering made by fire unto the LORD seven days: in the seventh day is an holy convocation: ye shall do no servile work therein. What verses seven and eight prove is that not all ceremonial holy convocations that involve rest from work can correlate with weekly Sabbaths. And so the fact that there are also holy convocation seven days apart in the seventh month (the 15th and the 22nd) loses its significance in view of the fact that holy convocations are only six days apart in the first month. But when we read the passage we find that the 15th, and 16th were days of cleaning up and getting ready for a meeting with the Holy God on the 17th. If one of these three dates must be chosen for a Sabbath from the narrative, better the 17th. And the LORD said unto Moses, Lo, I come unto thee in a thick cloud, that the people may hear when I speak with thee, and believe thee for ever. And Moses told the words of the people unto the LORD. 10 And the LORD said unto Moses, Go unto the people, and sanctify them to day and to morrow, and let them wash their clothes, 11 And be ready against the third day: for the third day the LORD will come down in the sight of all the people upon mount Sinai. But really, there is not enough data to make a Sabbath of any day. The argument, as worded above, might lead the reader to think that the Bible associates the 15th with “rest”, but the passage rather associates it with “camping.” As a preparation day, the 15th and 16th do not seem like Sabbaths. If this was true, namely that the 9th of the month was always a “first day” of the week, it would be a very strong argument indeed for Lunar Sabbath keeping. And ye shall count unto you from the morrow after the sabbath, from the day that ye brought the sheaf of the wave offering; seven sabbaths shall be complete: 16 Even unto the morrow after the seventh sabbath shall ye number fifty days; and ye shall offer a new meat offering unto the LORD. Now consider these two verses carefully. Seven Sabbaths plus one day is “fifty days” inclusive. That is seven complete weeks (first day through Sabbath) plus an additional first day. That is exactly 50 days with a continuous cycle of sevens. But interject into that mix two new moons and you suddenly have 52 days. In truth, Leviticus 23:15-16 is significant evidence against the Lunar Sabbath idea. So the evidence of a Sabbath is found in the “assembly of the congregation” on the 8th day. What does Exodus 40:2, 17 really show? It shows that the first day of the week was the day that the temple was constructed. The remainder of the chapter shows the immense volume of physical work that Moses did in raising up the temple. 2 On the first day of the first month shalt thou set up the tabernacle of the tent of the congregation. 17 And it came to pass in the first month in the second year, on the first day of the month, that the tabernacle was reared up. The priests were sanctified for a week. If we have to assign a seventh-day Sabbath to the story, the best place would be the seventh-day of their temple stay. But even this would be a stretch. The truth is that the story (Lev 8-9) doesn’t have any information about when the Seventh-day Sabbath occurred. The 22nd of the seventh month was always to be a holy convocation, the last day of the Feast of Tabernacles. So when Solomon kept it that way in 2 Chronicles 7:8-10, it doesn’t throw any additional light on the question of whether that holy convocation also coincided with the seventh-day Sabbath. Some find evidence in Esther 9 for a Sabbath on the 15th of the 12th month. But the passage indicates that both the 14th and 15th were kept as special days, and so the passage provides no information about whether the 14th, or the 15th, or neither of those days, was a seventh-day Sabbath. The story of Hezekiah describes sixteen days of cleaning the courtyard and temple. On the eighth day they started on the temple itself. They finished on the 16th. But there is no evidence here regarding the location of a seventh-day Sabbath. Indeed, it is quite apparent that if some day was kept holy, it was not the 8th. The fact is that we have no way of knowing the date of John 9, even if we do know the date of John 8:1-2. And John 9:6…says nothing about the blind man being in the temple. Paul’s Journey in Acts 20 is alleged to provide evidence for the lunar-calculation of the Sabbath. The reasoning goes like this: “The seventh day of their stay at Troas was the second day of the month which Paul refers to as the first day of the week.” And so if the first day of the week is the second day of the lunar month, then the month matches lunar-calendar expectations. The problem is that the math doesn’t work out right. If you count the days inclusively (as Jews always did) then they were in Philippi for the 21st. A plain reading of the passage makes it appear that they traveled on the 22nd (which would be an argument against the Lunar Sabbath reckoning). And there are just too many unknowns in the story. “After the days” could mean “immediately after” or “sometime soon after.” If I said, “after being at my mother’s home for Thanksgiving we spent the next few weeks at home” I wouldn’t be saying anything about whether I drove home on Thursday afternoon, Friday morning or even Sunday noon. It just wouldn’t be clear. But when I plot the events as they most likely occurred on a lunar calendar, I find the “first day of the week” happening on the third day of the lunar calendar at earliest. 1 During the Passover trip. The specific day is not specified. 2 Some Lunar Sabbath proponents list John 9 as an example of a 15th of the month Sabbath. This is based on the Feast of Tabernacles of John 7. The argument goes that the morning after the feast Jesus went into the temple and found this blind man. John 8:1 is, very likely, the 22nd of the 7th month. Granted. But to say that John 9:14 is the same day is a great stretch. While Jesus went into the temple in 8:2, he was wandering in 9:1, fifty-nine verses later. There is no way to say where day divisions are in the narrative. By chapter 11:55 you are already nearing Passover. The day-break verses just don’t often show up in the gospels. i If you are new to the topic of lunar Sabbath theory, there is a short list of time-keeping jargon that you may need to learn to understand what you are studying. A “lunar month” means the period between one new moon and another new moon. A “Gregorian month” means January or February, etc. The Gregorian month and calendar are named after the pope Gregory who decreed their particulars. A “Gregorian-style Sabbath” is one found on the seventh-day of the kind of your wall calendar, on Saturday. A “lunar Sabbath” would be one that falls seven, fourteen, twenty-one or twenty eight days after the new moon in any given month. ii Many lunar Sabbatarians are also feast-day keepers. While there is nothing wrong with keeping Jewish holidays, it is sensible to notice how John introduced them to his readers. He wrote of “the Passover, a feast of the Jews” and of “the Jews’ Feast of Tabernacles.” John 6:4 and 7:2. See also John 2:13 and 11:55.
iii If you have not yet had an opportunity to study Amazing Facts’ materials on Revelation 13-16, this argument may not be comprehendible. But in Revelation 12:17 and 14:12 God’s people are described as commandment-keepers. The world is tested over this issue. But God will never test the world over something that simple people can’t understand. iv If you are unfamiliar with this interesting prophecy from Daniel 7:25, see Amazing Facts’ Storacles of Bible Prophecy series. There you will see evidence that the Roman power would try to change God’s law during the dark ages. This prophecy was fulfilled. And its fulfillment shows the value of the Sabbath.